The John C. Maxwell Leadership Center at 12Stone Church in Atlanta honors the life and influence of John’s global and generational leadership as an internationally recognized leadership speaker, author and pastor. 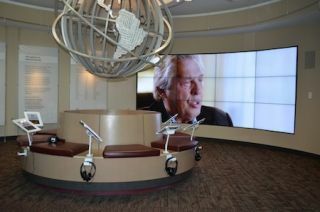 In celebration of his continuing legacy, visitors today enjoy interactive audio-visual presentations of John’s life and achievements across an immersive video wall controllable from several user stations. The engaging video and graphical content is driven exclusively by Renewed Vision’s ProVideoPlayer 2 (PVP2) software, bringing exceptional reliability and quality to a cost-efficient playback infrastructure. Velocity Productions, an Atlanta-based production and systems integration company, was tasked with building out the video wall on a curved wall, using a custom mounting system to cleanly integrate multiple 46-inch Barco monitors in a four-wide, three-tall configuration. The challenging integration project influenced the Velocity Productions team to evaluate technologies on the playback side that would not only deliver reliability and quality, but also bring balance to equipment and labor costs and maintain operational simplicity moving forward. Velocity Productions also developed a custom Savant Systems iOS app to control the video wall content. PVP2 integrates with a Savant Systems controller via the DMX over Artnet protocol to add a second interactive element to the experience for the staff. This allows staff to scroll through and recall any of eight educational videos produced exclusively for the John C. Maxwell Center from an iPad, iPhone or Apple laptop. The eight videos otherwise rotate across the video wall on a continuous basis, all focusing on John’s leadership reputation with each video dedicated to a specific time in his life.